I’m always willing to try shortcuts once. My Mom makes shiratama zenzai from scratch (see Homemade Zenzai recipe here) and will use store-bought fresh made mochi as a short-cut, but she’ll never use canned ogura-an and Mochiko (for instant mochi, although I believe there is also shiratamako which I have not yet come across) to make shiratama zenzai. Although Mom always knows best, I had to see for myself whether I could get away with some major shortcuts and still end up with pleasing results. 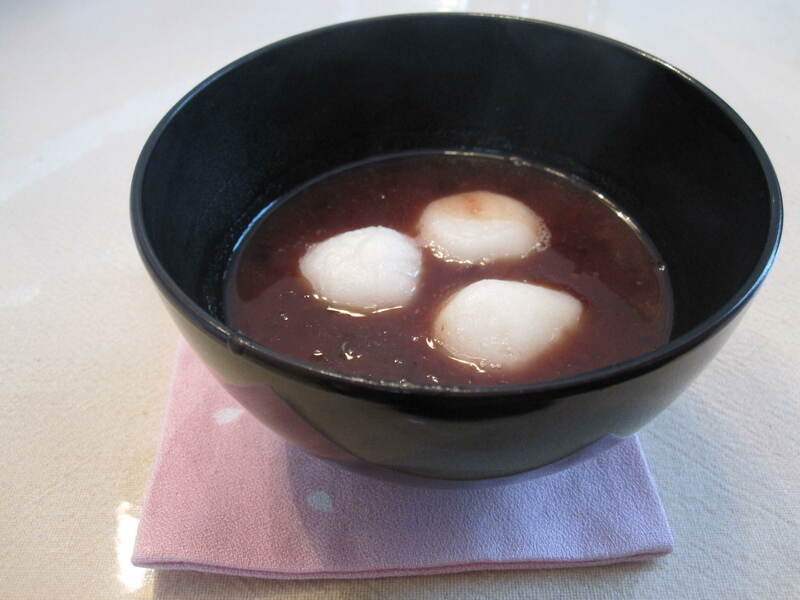 Shiratama zenzai is a sweet red bean soup with mochi. There are variations of this traditional Japanese dessert where the mochi is grilled to perfection (crisp on the outside with grill marks and puffy and soft on the inside), boiled, or slightly cooked in the microwave or toaster oven. As a child, I never liked zenzai, but things change. While anko is still not my choice of Japanese dessert, for example I prefer homemade kinako ohagi with no anko versus the traditional ohagi wrapped in anko, I’ve found a new love for zenzai. I think this largely came to be because of the many Chinese restaurant dinners I’ve enjoyed with my in-laws and the wonderful red bean soup that is always served at the end of our meals. At first, I often declined the red bean soup dessert, but soon I found myself taking two to three bites, and now, I always finish the entire bowl and would happily accept seconds. My newfound love of Chinese red bean soup reminded me of a dessert that I remembered my Mom used to make for her and her friends when I was young, zenzai. Of course, at the time I had absolutely no interest in anything with red beans and largely ignored this dessert in our home, but not too long ago I decided I wanted to try making this myself. This was largely inspired by the fact that I found a can of ogura-an on sale at Marukai. After tasting this instant version of my Mom’s zenzai, I must say that the canned ogura-an doesn’t do justice to shiratama zenzai but it’s not bad. I made this for my parents and both enjoyed it and agreed that it wasn’t a bad alternative to homemade zenzai but the latter is definitely better. I should also mention that the canned ogura-an was a bit too sweet for my liking. 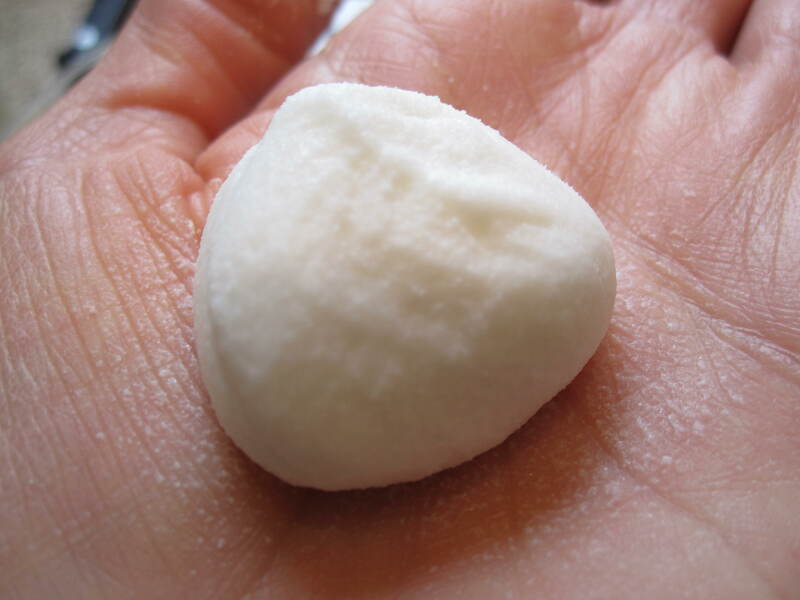 However, the shiratama was very satisfactory and I appreciated the soft pillowiness of this mochi. So why share this instant recipe if I feel the homemade version is much better, you ask? It was a good trial and it’s not bad for a quick dessert and it won’t disappoint. Next time, I will share with you my Mom’s homemade zenzai. I have yet to try making this myself but my mom professes it’s ease. It just takes time and patience for the beans to cook. 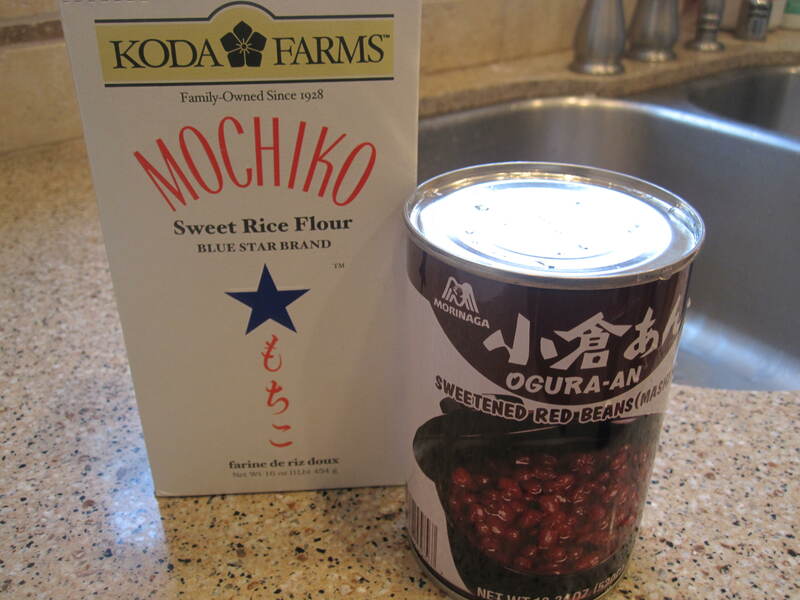 1) In a small bowl, combine Mochiko flour and water. Gently mix with chopsticks until incorporated. Next, gently knead dough with fingertips until the dough is soft and pliable. 2) Bring water to boil in a medium pot. 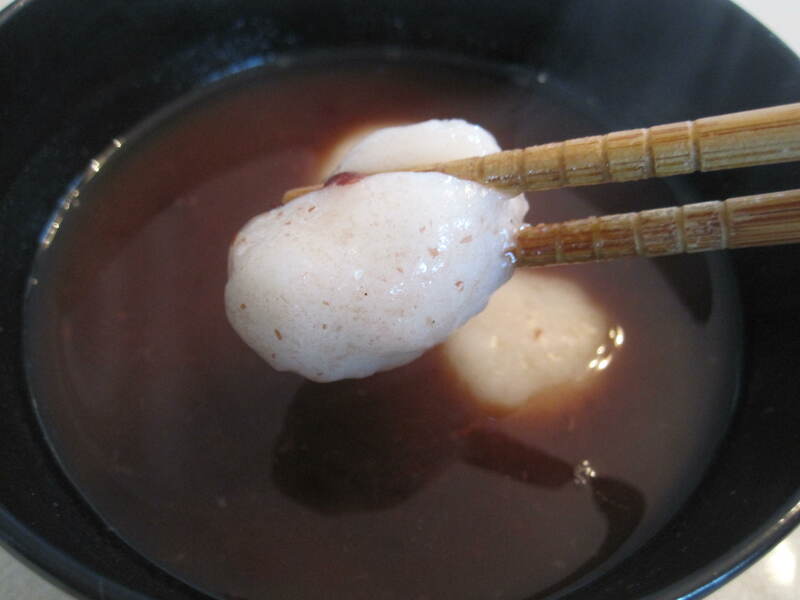 Meanwhile, scoop approximately 1/2 tablespoon heaps of mochi dough and gently shape them into balls. NOTE: The dough will be very soft, but it should mold into balls. 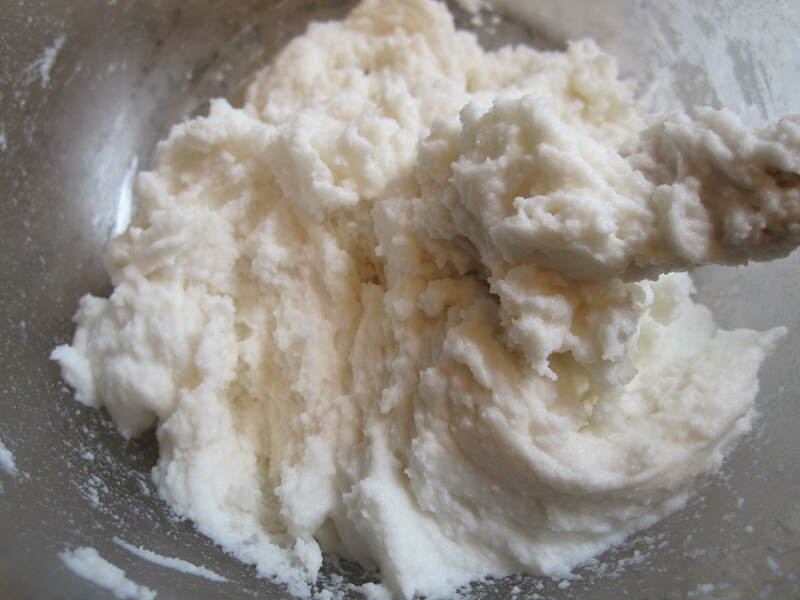 If the dough is sticking to the palms of your hands and will not keep it’s shape, add more Mochiko flour. This is a picture of a particularly large shiratama on my very dry palm. This must have been towards the end of the batch. 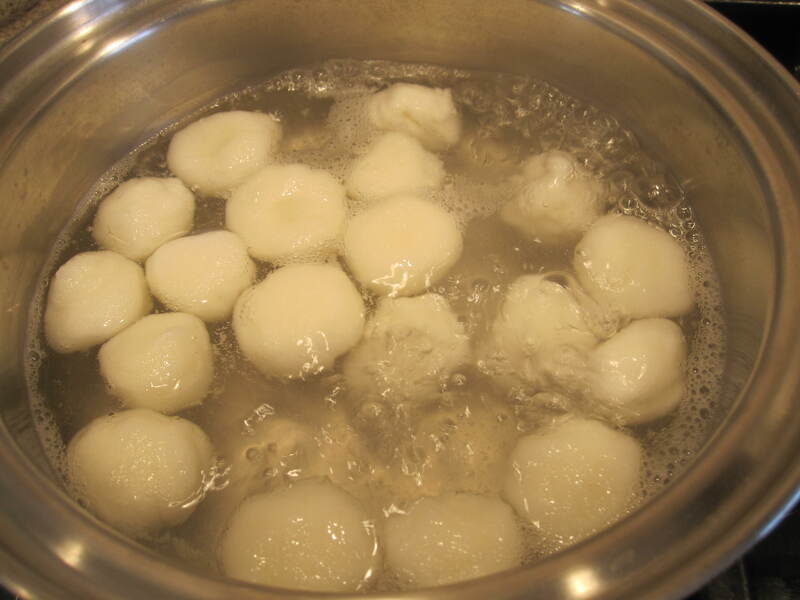 3) Drop mochi balls into boiling water and cook for about 3 to 4 minutes. At first, the mochi will sink to the bottom of the pot, but when they are cooked they will float to the top of the water. Until I was ready to serve the shiratama, I left them in the pot of water after turning off the heat. If you prefer, place cooked shiratama in a bowl of cold water. 4) Add the contents of 1 can of pre-cooked agura-an to a separate medium pot. Add 3/4 to 1 cup water. Gently bring to a boil. Add water depending on how thick you prefer the soup. This is what ogura-an looks like straight out of the can. 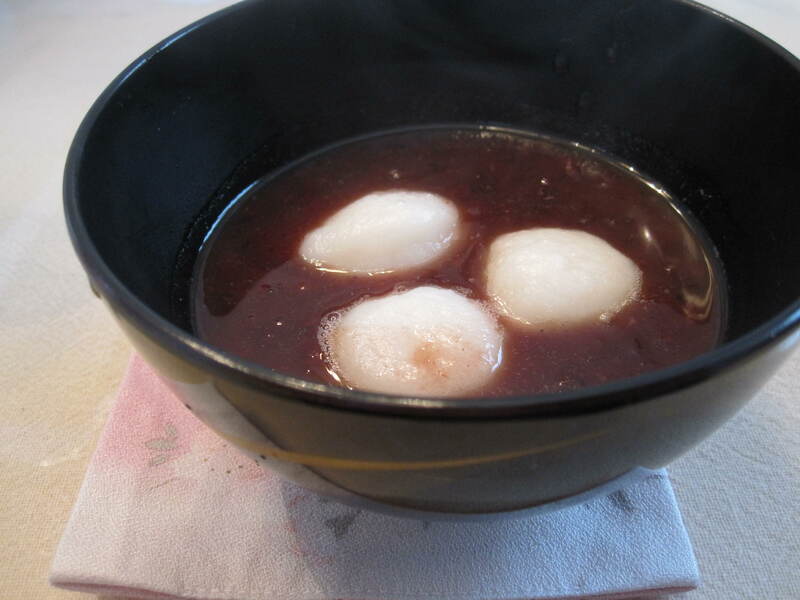 5) While hot, pour zenzai (soup) into small serving bowls, gently place a few shiratama in the soup and serve. This entry was posted in Desserts & Treats, Vegetables & Vegetarian, Wagashi | Japanese Sweets and tagged azuki, instant zenzai shortcut recipe, mini sweet rice ball, mochi, Mochiko, Oguru-an, shiratama mochi, Shiratama Zenzai, sweet red bean soup by Judy | Bebe Love Okazu. Bookmark the permalink. When can I come over for dinner?? hmm??? Shortcut, huh? I love shiratama zenzai! I enjoyed this when I was taking tea ceremony lessons. For new year’s, this was served and I really enjoyed the bite-size mochi!! I’ve always love zenzai. I looked forward to new year’s just to have zenzai! I’ll have to see if the anko you use is available here. I think I’ve bought shiratamako once. Or maybe my mom had it and I actually made it. Thanks for sharing this simple recipe! Might be a nice treat over the weekend! I’m sure you’ll be able to find the canned ogura-an all over Hawaii at the Asian supermarkets. It’s not cheap though! Regular price, without the sale was about $4 and some change. I would love to try your mom’s zenzai recipe. I might actually try make the easy version for Thanksgiving. I’m surprised you didn’t like mochi or manju growing up. I almost always get dorayaki if it’s on sale and I wish there were yatai around that sold taiyaki. Man this is getting me to think what other snacks I like. Morinaga caramel, Yan-Yan (choco or strawberry), arare mix (esp ones with wasabi peas and small crunchy/sweet fish; I don’t know what those are called) are some off the top of my head. I love this. I think it is a New Year’s dish. I remember eating it when I lived in Japan. I never grew up with it unfortunately. Yours looks so yummy and comforting!! Ah, so I think I should definitely make this for New Year’s! :) Thanks, Melissa!